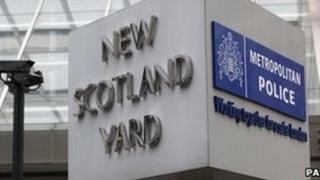 The police team investigating phone hacking has been boosted from 45 to 60 officers, Scotland Yard has said. Metropolitan Police Deputy Assistant Commissioner Sue Akers said the move came after a "significant increase in the workload" over the past fortnight. Meanwhile, the investigation into alleged misconduct by newspapers may be spreading beyond News International. Police have asked for files of an earlier inquiry into the use of private investigators, the BBC has learned. According to BBC Radio 4's The Report, the files from Operation Motorman, which was run by the Information Commissioner's Office in 2003, were requested three months ago. The Daily Mail said the information obtained may have been for reasons of public interest, and Trinity Mirror Group said its journalists worked within the law and the Press Complaints Commission code of conduct. On the hacking probe known as Operation Weeting, Ms Akers said there had been a "surge of enquiries and requests for assistance from the public and solicitors. "I have said all along that I would keep the resources under review and this has led to the increase. Similarly, if the demand decreases, I will release officers back to other duties." The expansion in officer numbers comes after a Commons home affairs committee report praised Ms Akers' decision that all potential victims of phone hacking by the News of the World should be contacted. But the MPs said they were "alarmed" only 170 people had so far been informed and noted that "up to 12,800 people may have been affected". They warned that if the process dragged on it would "seriously delay" the start of Lord Justice Leveson's public inquiry announced by Prime Minister David Cameron. After Ms Akers' announcement, home affairs committee chairman Keith Vaz said: "This is excellent news. The extra resources will assist to help move things along much more quickly." Speaking at a press conference on Thursday, Deputy Prime Minister Nick Clegg said the public's faith in institutions like the police had been "shaken" by the phone-hacking scandal. He said people's "low and cynical" opinion of politics had probably become lower still as a result of the affair and there was now an opportunity to clean up the "murky" practices and relationships that had taken root. Innocent members of the public and their families had their privacy "abused in an outrageous way", he added. In other developments, it emerged that former News of the World editor Andy Coulson was only given mid-level security clearance when he went to work as the prime minister's communications director in May last year. A Cabinet Office source confirmed to the BBC that he was subject to the "security check" level but not the more rigorous "developed vetting" level. Mr Cameron told the Commons on Wednesday that Mr Coulson was not able to see the government's most secret documents. Elsewhere, the legal firm that represented News of the World owners News International (NI) has been given permission by the newspaper group to answer questions from the police and MPs. Harbottle & Lewis is said to have received e-mails from the company four years ago which the legal firm concluded did not reveal reasonable grounds for believing the hacking went beyond the News of the World's royal editor Clive Goodman. But on Tuesday, former director of public prosecutions Lord Macdonald, who reviewed for NI's owner News Corporation the e-mails in a file relating to bribes allegedly paid to police, said they contained "evidence of serious criminal offences". The law firm had said it was being prevented from responding to "inaccurate" comments made by News International chairman James Murdoch because it was not allowed to breach its duty of client confidentiality. Also, Labour have seized on remarks by the culture secretary as an "admission" that Mr Cameron had discussed the BSkyB takeover bid with News International. Mr Cameron faced repeated questions on the issue in the Commons on Wednesday and told MPs he had had no "inappropriate conversations". But Jeremy Hunt said afterwards that "the discussions the prime minister had on the BSkyB deal were irrelevant" because he, as culture secretary, was responsible for making the decision, prompting the Labour attack. Mr Hunt's aides later said he had been talking about discussions in general, rather than specific discussions with NI executives. Conservative deputy chairman Michael Fallon dismissed what he called petty point-scoring by saying former NI executive Rebekah Brooks and Mr Cameron were both clear no inappropriate discussions had taken place. During his Commons statement, Mr Cameron told MPs that "with hindsight" he would not have hired Mr Coulson. Labour MP Nick Raynsford said that when Mr Coulson was still working at Downing Street, the cabinet secretary had been alerted to evidence of illegal phone hacking, covert surveillance and hostile media briefing against a senior government official - a claim the cabinet secretary denied. But the Cabinet Office later completely reversed its position, conceding that a meeting on the matter did take place last summer.